Crystal balls are a lot of fun. You ask a crystal ball a question about your future and it answers in a single word: Yes or No. Crystal balls have been used at family functions and informal gatherings as a source of entertainment and clean fun. A crystal ball may accurately predict your future, but it may not have any answers when it comes to offering solutions to emotional issues one encounters on a daily basis. For instance, if you are having problems with your relationships, trouble with your career, issues with your family; a crystal ball can only provide a yes or no solution. Talking to a therapist is a luxury an average American may not be able to afford. So, how does one solve the complex emotional and psychological issues that affect our daily lives? If you cannot afford your neighborhood therapist, how about having the ‘father of modern psychology’ counsel you on your emotional issues, for a fee that is equivalent to the price of two six-packs of beer. The fee is just a onetime investment. Accoutrements- creators of whacky e-toys, gifts, and novelty products- brings to your doorstep the man who invented psychoanalysis and therapists, in a crystal ball avatar that is bound to leave you in splits, laughing. After all, laughter is the best medicine. Accoutrements proudly present the ‘Dr Sigmund Freud Therapy Ball’ for all your psychological issues. 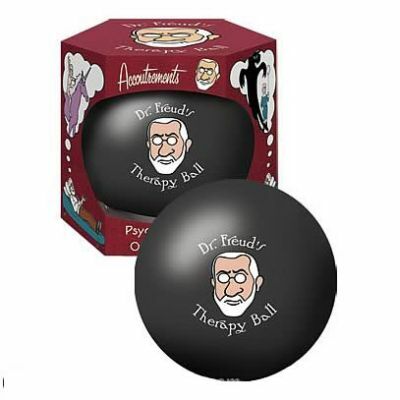 The therapy ball comes in the shape and size of a crystal ball, completely coated in black, with a colour caricature of the bearded Sigmund Freud imprinted on the front. The words, ‘Dr Freud’s Therapy Ball’ is inscribed around the doctor’s caricature in an ancient calligraphic font. This particular font is used to recreate the age in which Dr Freud lived and worked, giving the therapy ball some amount of realism. If you are stressed about your partner, family, kids…and would like to de-stress by laughing about it (the best form of therapy), then just hold the Freud Therapy Ball in your hands and ask it why a particular issue is bothering you. For the answer, just flip the ball and we guarantee you that the therapy ball’s response will have you smiling. Some of the thoughtful responses of the therapy ball include “Talk about your mother” and “How did that make you feel?”. Typical Freud. If you are looking for a therapist who will actually help you without bankrupting you, try ‘Dr Freud’s Therapy Ball’. It costs only $9.99. Not just this, you can also take a look at this Braille Ball to know more about balls that serve dual purpose.